After months of anticipation for its release, Marvel and Sony have finally released their first trailer for Spider-Man: Far From Home. For fans who haven't figured it out already, one way or another Spidey has managed to come back from the disastrous events of Infinity War. While this trailer gives no indication of how that happened, we do get what could be some hints of a post Endgame MCU. Not only that, but we also get our first look at Jake Gyllenhaal in a full comic accurate Mysterio costume, and confirming the talk that he is in fact a hero in this movie (As far as we know). 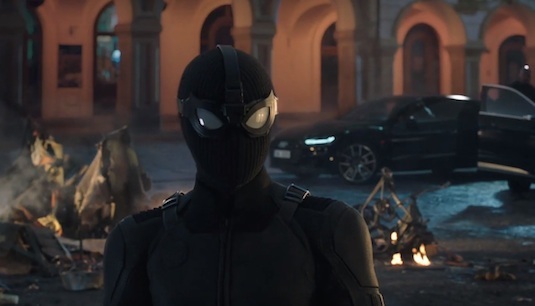 Most of us are of course looking for hints of how the events of Avengers: Endgame have affected Spider-Man and his world, but Jon Watts and Marvel keep that under wraps. But there is of course a troubling lack of Tony Stark in the trailer, but this could be done to throw fans off. 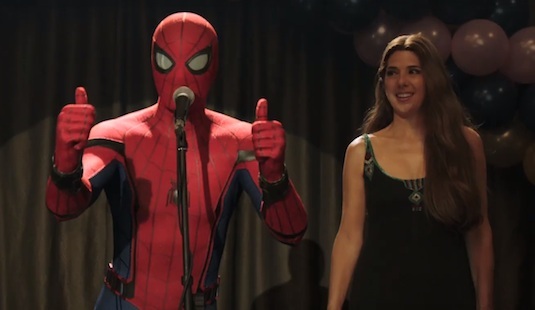 We also now know Aunt May is fully aware Peter is Spider-Man, playing off what we saw at the end of Homecoming. She'll apparently be working for some kind of charity or shelter like she does in the Spider-Man PS4 video game, and helping use Spidey in costume as a figure of the community. As for the Europe trip Peter will be embarking on with his school later in the movie, we see strong hints of his relationship with Zendaya's Michelle developing. We also see Peter's reluctance to take the Spider-Man suit with him, once again playing off the common Spidey trop of him having to balance his adolescent life with his superhero life. We then of course see the entrance of Nick Fury as it was described in the trailer shown in Brazil a few months ago, shooting a dart at Ned in order to assign Peter a mission. We know at some point after that is when Fury gives him the Stealth Suit, and explains to him he'll be working with another "hero" named Mysterio. 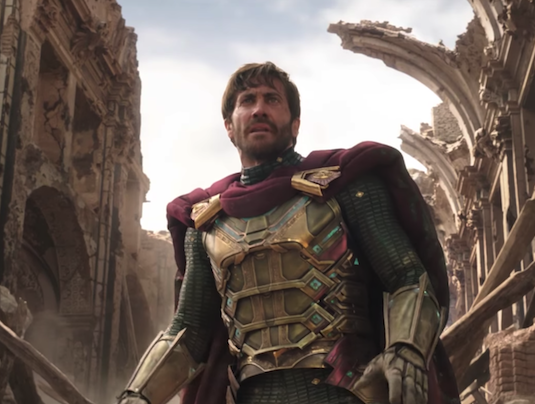 We get our first look at Jake Gyllenhaal and the full comic book accurate Mysterio costume in all its fish bowl glory. 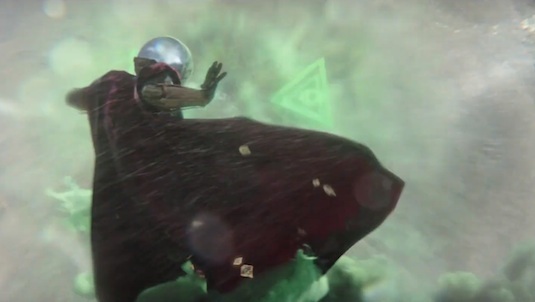 Its still hard to tell if this version of Mysterio actually has powers, as some of the things he does are reminiscent of Doctor Strange. Its more likely this is just all part of some effects and illusions he's able to pull off like he does in the comics. We see him fighting the Elemental creatures and warning Peter not to get involved. Fans still believe of course that Mysterio is actually the one controlling them in order to make himself look like a hero. Peter's classmates even describe him as a cross between Thor and Iron Man, hinting at the public's positive perception of Mysterio so far. So what did you think of the Far From Home trailer? Are you happy with how Jon Watts has adapted Mysterio for the big screen? Do you think he'll end up being the villain? Let us know below!